JS Series Concrete Mixer usually combined with various models batching machine,Composed to Belt Conveyor Concrete Batching Plant or Skip Hopper Concrete Batching Plant,which applies to various kinds of large & medium scale prefabricated factories and all kinds of construction sites,roads,bridges,airports,tunnels and other projects. The mixing drum is one of the important working parts of the JS twin shaft forced mixer. Its first function is as a mixing place for the raw materials. The second function is as a support part, connecting the mixing structure, main driving mechanism, discharging gate, pneumatic elements, lubrication and hood. 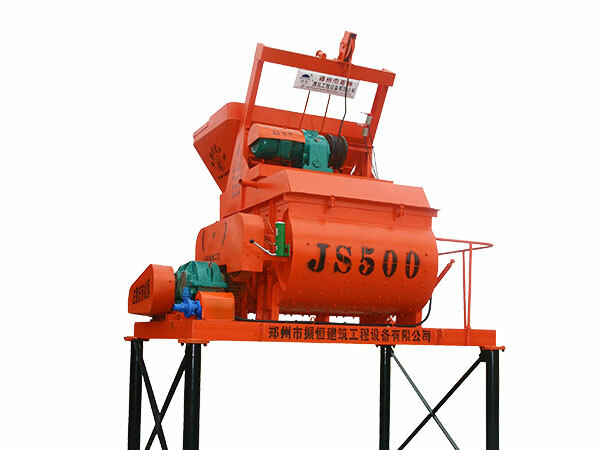 JS Twin Shaft Concrete Mixer as a whole is made of welded thick plate with good quality. The inner part adopts special manganese alloy wear-resistant plate and blade, the double horizontal shaft forced mixer bottom has discharging gate. The mixing part consists of two parallel shafts which are equipped with mixing arm,blade, plate,shaft end support and a shaft end seal. (Shaft end seal device has got the national patent (China)). Each mixing shaft is equipped with a mixing arm which has been connected with blade and side blade. During the working, mixing blade not only moves the material in the axial and radial directions, but also squeezes the material between the two shafts to make mixing process powerful and evenly and quickly. The side plate is used to scrape off the residue on the lining. If the blade is worn, it can be rotated 180 ° to adjust the position and continue to use. 1 The relative position of the two mixing shafts will directly affect the mixing quality of the material. Please follow the instructions in the product manual or on-site installer. 2 The distance between the mixing blade,the side blade and the plate should be ≤5 mm. The relative position and direction of mixing arms must conform to the illustration in this manual.